I have always wondered about the significance of Snakes and Nagas. They seem to hold a special place not just in Hinduism but across many communities and religions. As snakes grow, many of them shed their skin at various times, revealing a shiny new skin underneath. For this reason snakes have become symbols of rebirth, transformation, immortality, and healing. Snakes invoke fear, awe and a sense of mystery. There are also many unanswered questions about them. This blog hopes to throw some light on the history of mans association with Naga’s. Every ancient Indian temple has a corner below a pipal tree dedicated to statues and sculptures of snake gods. Many of our Gods from Vishnu to Shiva to Kathikeya are associated with snakes. A devout Hindu never kills a snake. The great Rishi Patanjali is represented as half snake – half man. He was a Naga living on earth. The ancient Greeks considered snakes sacred to Asclepius, the god of medicine. He carried a caduceus, a staff with one or two serpents wrapped around it, which has become the symbol of modern physicians. For both the Greeks and the Egyptians, the snake represented eternity. Ouroboros, the Greek symbol of eternity, consisted of a snake curled into a circle or hoop, biting its own tail. The Ouroboros grew out of the belief that serpents eat themselves and are reborn from themselves in an endless cycle of destruction and creation. In the mythology of ancient Egypt, Apopis was a demon of chaos who appeared in the form of a serpent. Each night he attacked Ra, the sun god. But Mehen, another huge serpent, coiled himself around Ra’s sun boat to protect the god from Apopis—a perfect illustration of how snakes can be symbols of both good and evil in mythology. Kerala is one state in India where Snakes are worshipped in almost every village. 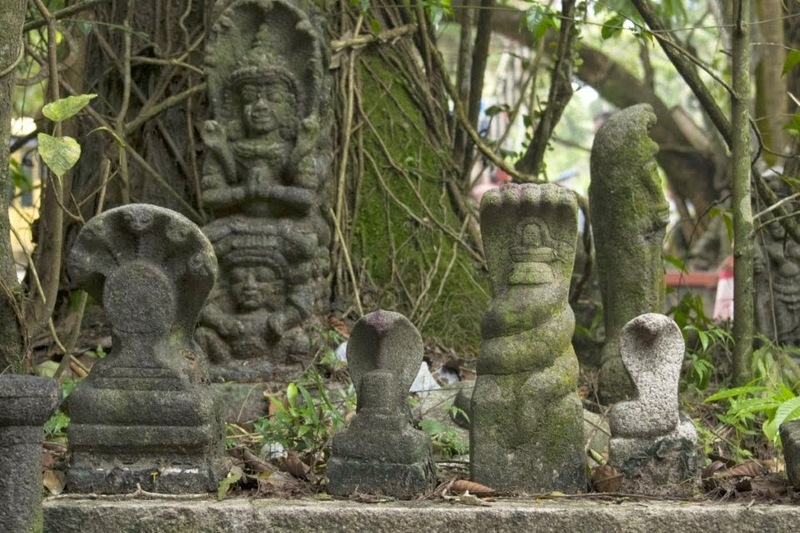 There are about 2000 Sarpa Kavu’s or sacred groves all over Kerala dedicated to snakes. There is a mythological story associated with this. Parasurama the creator of Kerala is said to have prayed to the Naga King to help remove the salinity of the land and the Snake God obliged. The ancient temple of Mannarsala (56 Km from Kollam) is dedicated to the snake God Nagaraja as this is the place where Parashurama is said to have prayed to the snake god. The only place where I have read a detailed and fascinating account of Nagas and their association with humanity is in the lovely book “Apprenticed to a Himalayan Master” by Sri M. An enlightened soul, Sri M runs the Satsang Foundation and conducts retreats and Satsangs all over the world. I have had the privilege of meeting him and attending his Talks. I am sharing below excerpts from his book that throws light on why we worship Snakes and what their association has been with mankind. On the third night at Arundhati cave, I was woken up by what I at first thought was the rumbling of thunder. I opened my eyes and saw Babaji in his usual sitting posture, back towards me, silhouetted by the light of the Dhuni. I looked beyond, and from between two parting clouds, emerged something that was roughly the size of a full moon, but could not be the moon. Instead of the cool, silvery, white light shed by the moon, this object was a glowing ball of fire, and as it moved closer the rumbling became louder. Then it came towards the cave and landed right on the Dhuni, with the sound of a thunderclap. I was so scared that I could not even sit up, but Babaji sat upright like a statue, unaffected and unmoved. I wanted to call out to him, but my vocal chords refused to function. Some¬ how, I pulled myself up to a sitting position. My whole body trembled with fear. A strange spectacle unfolded before my astounded eyes. The rumbling had stopped and there was utter silence. The fireball, which was about two feet in diameter, split vertically into two, and out of it emerged something that caused goose pimples all over my body. It was a large snake, with a hood like a cobra, glowing electric blue, as if made of a transparent, violet, glass like material, with electric filaments lit inside. The snake-like creature’s eyes glowed, and it hissed softly. My fear vanished the moment I saw the creature bend down and touch Babaji’s feet with its hood. Babaji blessed it by touch¬ ing its head with his right hand, and then did something, which for a second, made me wonder if what I was seeing was a silly dream, or reality. He hissed in reply. The blue cobra straightened up and sat facing Babaji. A hissing conversation went on for quite some time. Then Babaji said, “Madhu, come forward and see the deputy chief of the Sarpa Loka.” I moved forward and carefully sat behind Babaji. The snake hissed. Babaji said, “Bow down to Nagaraj.” I bowed low before the snake. At close quarters, I could see that he was quite big and had intelligent sparkling eyes. The snake hissed and touched my head with his forked tongue. I found that I was not the least bit frightened, although I could feel a mild electric shock passing through my body. “Yes,” Babaji said, “you are right. Not many will believe this experience of yours but you will have to share it with the public, when you write your autobiography. It does not matter who believes or does not, but I will explain to you. Truth is often stranger than fiction. “In the Milky Way, there exists a stellar system with seven planets and eighteen moons. One of these planets is called Sarpa Loka, and is entirely inhabited by highly evolved, hooded snakes. The serpents are called the Naga devatas. The person you saw is the deputy chief of this realm and he is called Naga- raja. The supreme head of the Nagas is the five-hooded golden serpent, known in ancient Indian texts, as Anantha. “Thousands of years ago, when humanity was still in infant stages of mental evolution, there was regular contact with Sarpa Loka. The wise and evolved Nagas frequented the earth, and spent long periods here, teaching and educating human beings. The snake worship you come across in all ancient civilizations is a tribute to the advanced Nagas of yore. Their images were venerated for the deep wisdom that they possessed. They also taught the secret of the kundalini energy initially, again symbolised by a serpent. Patanjali who gave the world the Ashtanga Yoga Sutras , was himself a Naga, and is depicted as half man and half snake. The snake on the pharaoh’s head and the snake coiled around the yogi-god Shiva, are all symbolic representations of wisdom and power, imparted to certain human beings by the Naga teachers. “But then, as always seems to happen, human beings, as they became more powerful, began to also become more self- centred and cunning. Humans, or at least a majority of them, were ready to even kill for personal gain. Some felt threatened by the intellectually and spiritually superior Nagas, and forgetting their indebtedness, began to use the powers that they had acquired from the Nagas against them. “At one point, there were large scale massacres of the Nagas. The Supreme Naga Chief decided to recall the Nagas from earth, and cut all connections, except with some human beings who were highly evolved spiritually. Overnight, they were transported back to Sarpa Loka. A small number of Nagas, who were either sick or too old, or in rare cases, rebels who defied the orders of the Supreme Chief thinking that they still could do something with the human beings, got left behind. “The serpents and snakes that exist in the world today are the descendents of those who were left behind, and who, through years of in-breeding, have become retarded, and no longer possess the great qualities of their ancestors. “Babaji,” I said, “all this sounds so bizarre, that if I ever wrote a biography – which I might do, at some point, since you say so, the readers would either dismiss it as the ravings of an unbalanced mind, or as pure fiction. I don’t care. So let it be.” Babaji laughed. “I repeat again,” he said, “truth is stranger than fiction, and even if the story stimulates their imagination, there is hope that they might at some point realize that there are greater realms of consciousness which cannot be comprehended by dry logic, and currently available levels of intelligence. “However, by the time you attempt your biography, even the scientific world would have expanded its knowledge of outer space and other planets. The suspicion that life exists, or ex¬ isted on other planets or stellar systems, will be strengthened by the discovery of water, and other conditions suitable for the evolution and sustenance of life forms in hitherto unsuspected parts of the cosmos. Perhaps, some unprejudiced scientist might consider it worthwhile to at least give your story the atten¬ tion it deserves. Beyond that, considering the stupid attitude of dismissing anything that does not fall under the category of ‘established norms’ as unscientific, have no hope.